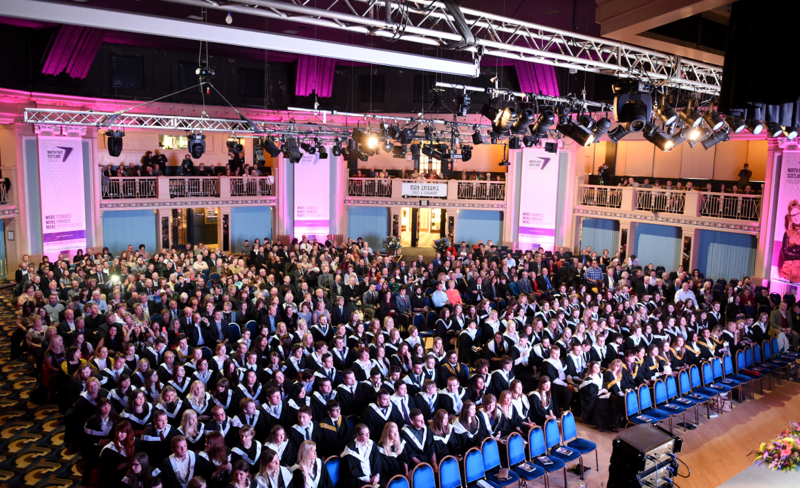 Hundreds of proud families poured into Aberdeen’s Beach Ballroom yesterday to loved ones pick up their degrees and officially graduate from North East Scotland College. After a bumper year with more than 6,800 full-time people studying at the college – the highest number ever – the famous ballroom was packed with the beaming faces of mums, dads, and families eager to celebrate their children’s achievements. Principal Rob Wallen used his welcome speech to highlight the college’s many achievements in the past year. He told the crowd: “We have continued to invest in our estate – with further work having been carried out across all of our campuses. “I am delighted to say that we have recently received a civic society award for the transformation of our Aberdeen city campus in the Gallowgate – which has both transformed its appearance and vastly reduced its carbon energy usage. “In Fraserburgh we are just getting underway an £8million programme to refurbish and extend the campus to provide improved facilities for engineering, motor vehicles and construction – and to provide for the first time laboratory space so that we can provide science courses. The Press and Journal’s editor-in-chief Damian Bates also spoke to the young graduates about his journey from his first job as a trainee reporter in Middlesborough in 1990 to joining the Aberdeen Journals, and going on to being appointed the chairman of the editor’s committee of the Scottish Newspaper Society. Addressing the group after they received their certificates Mr Bates said: “It’s amazing what you can achieve if you are passionate about it. “Every day I count my blessings and know how lucky I am, and you can be that lucky too if you work too hard enough.